Ferren, the chief creative officer of Applied Minds LLC, returned to Esri in January to keynote the fourth Geodesign Summit, reiterate his first call to action, and deliver another: develop a 250-year plan for the planet enabled by geodesign to create a vision of the future. The Community Analyst geodesign tool can be used to glean information about a variety of community/people focused demographic data and reports. "Geodesign combines geography and data with modeling, simulation, and visualization to tell stories and [show] the consequences of your actions," Ferren told the more than 260 architects, urban and transportation planners, GIS and design professionals, educators, and others, in attendance. He sees great potential for geodesign to ultimately help find solutions to complex problems. "It is still in the shiny object stage, but it will be very important," he said. Geodesign technology will mature naturally, much like other technologies, such as GPS, did. But meanwhile, said Ferren, in this era of short attention spans, people need to start thinking far, far into the future to create a problem-solving template that can be built on over time. "If we are going to address these big global issues facing us—whether that's disease, education, freshwater, war, or global warming—you actually have to take a long view," Ferren said. "For this planet, we need—pick a number—a 250-year plan." This process will be collaborative, too, according to Ferren. "That's the power of geodesign," he said. "It's this network extension of shared intelligence where the insights of individuals can be shared among others and that can be used as the foundation to build upon." 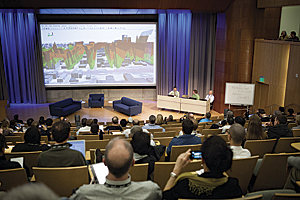 The fourth Geodesign Summit in the Esri auditorium. Ferren also said that geodesigners in the future will be entrusted with the same power over life and death that doctors have today, because the decisions they make will be critical to humans and other species. "The mistakes you make in planning and designing our cities may take 100 years until someone understands the consequences of those actions. The Hippocratic Oath for geodesign: First, do no harm," he said. "Understand what you are doing and the effect; if you know this is going to do long-term damage, it is not okay to do it. We aren't on this earth very long. It's a mere blip. Try to leave it a little better than how we found it." Summit attendees also heard from Esri president Jack Dangermond, who spoke about his enduring belief in technology as an agent of positive change to tackle the planet's big problems. "In my life, I always believed technology could matter," he said. He also spoke about a shift, with GIS becoming a platform technology that's more participatory than ever before because it is now widely available via a cloud gateway that supports applications on the web and on mobile devices. This idea of GIS as a platform was brought home to the audience with demonstrations that showed the increasing simplicity of making online maps using ArcGIS Online and Esri Story Maps templates. Esri staff also gave short demonstrations of Community Analyst, which is used for mapping demographic, health, and other data, and Esri landscape analysis services, a new set of data services (still being tested in beta) geared specifically toward geodesign work. For his demonstration, Esri technology evangelist Bern Szukalski used Esri landscape analysis services to study the siting of the Ivanpah Solar Electric Generating System, currently being built in the Mojave Desert. He used Esri landscape analysis tools to study the solar power-generating potential at the site, the slope of the terrain, and critical habitat areas for desert tortoises in proximity to the solar project. 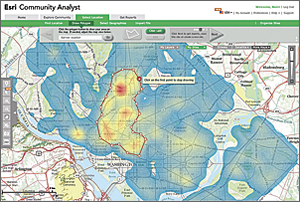 Esri landscape analysis services are well suited for regional planning projects to study various scenarios. Another geodesign-related technology demonstration showed how Esri technology was used to model the impacts of transit-oriented development in 3D for the city of Honolulu, Hawaii (see "3D Modeling Shows Off Elevated Rail System Landscape"). With the city's population expected to increase by 164,000 people by 2050 and traffic congestion a problem now, Honolulu faces major development decisions. Esri solutions engineer Eric Wittner showed how Esri software was used to model alternative futures for Honolulu. First, GIS information, prepared using Esri ArcGIS for Desktop, and 3D GIS data from Pictometry and PLW Modelworks, which represented realistic building models for portions of the city, were combined in Esri CityEngine. CityEngine is 3D modeling software for urban environments. One scenario showed significant urban sprawl if thousands of new single-family homes were built outside the urban core. Another 3D model showed much less of a footprint in undeveloped areas if the city built up with people living in tall buildings near a multibillion dollar light rail system currently under construction. These technology demonstrations were inspiring to many Geodesign Summit attendees, such as Juan C. Perez, director of transportation and land management for the Transportation and Land Management Agency, County of Riverside, California. "The session that focused on the visual modeling and analytic tools when presenting land-use decisions to policy makers was excellent," Perez said, adding that he would like Riverside County to use some of the tools. Elliot Hartley, a director of Garsdale Design Limited in Cumbria, United Kingdom, gave a talk called "The Instant City—Geodesign and Urban Planning." His firm, along with its Iraqi Planners Group, is creating a master plan for the city of Nasiriyah, Iraq, which includes plans for future housing, utilities, and infrastructure. Garsdale used the capabilities in Esri CityEngine, 3D modeling software for urban environments, to change the plans when new data was added or late changes were made. Work that took four days using other software took only a half day using CityEngine, he said (see "CityEngine Creates New Solutions for Historic Cities"). For more information, visit geodesignsummit.com.